In 1959 Fidel Castro took over power in Cuba, and all Cuban citizens were encouraged to support the Revolution. People who refused were jailed and often executed. Even children fell victim to the Communist propaganda, and they too were encouraged to join youth groups supporting the Revolution, often being removed from their families to become young soldiers. Rumors began to circulate that the Castro’s new government had plans to take control of all Cuban children, and many of them would be shipped to work camps in the Soviet Union and other Communist states. In order to avoid this fate, many parents made the heartbreaking decision to save their children by sending them to the United States. Between 1960 and 1962, over 14,000 Cuban children came to the United States in what became known as Operation Pedro Pan, aided by the U.S. government, the Catholic Church, and underground organizers in Cuba. Some of the children had friends or relatives to go to in the U.S., but many did not; those children were placed in foster homes and orphanages, hoping to one day be reunited with their families. Many were eventually reunited with their families on U.S. soil; many never saw their Cuban families again. 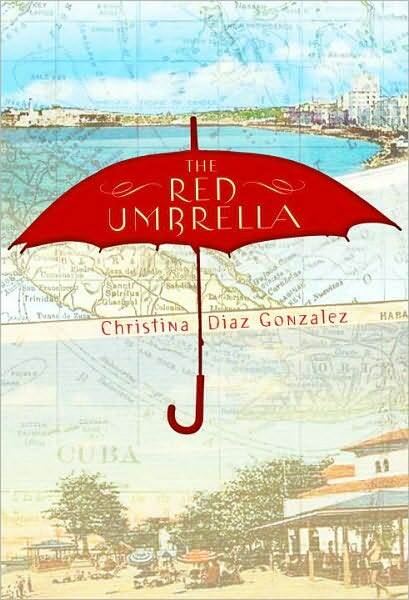 The Red Umbrella is a fictional account based on true events. Loosely based on her own parents’ (who were children of Operation Pedro Pan) story, the author tells of Lucia and Frankie, a teenage girl and her young brother who grew up enjoying a typical middle-class life in Cuba. One day, however, soldiers show up in their small town, and things begin to change. Suddenly, the Revolution is no longer something abstract they hear about second- and third-hand; suddenly, the Revolution has come home to roost right in their neighborhood. The family is gradually stripped of its rights, its possessions, and all feelings of safety and security, as even friends and family become enemies. Finally, Lucia and Frankie’s parents make the agonizing decision to send them to the U.S., unaccompanied, hoping kind strangers will care for them until they can be reunited. Once in the U.S. the kids naturally face somewhat of a culture shock. Is the United States as evil and corrupt and violent as Cuban propaganda had reported? Plunked down in Nebraska with a nice but somewhat alien family, Lucia and Frankie are homesick and scared. Over time, however, they grow to love their foster parents, their new school, their new way of life, and their new country. This book is actually a children’s novel, geared towards 6th – 9th graders. It is, therefore, a pretty quick and easy read, even at almost 300 pages. This is my book club’s current pick, and my friend Robin who will be hosting is having as a guest at the discussion a woman who actually was a Cuban refugee child under Operation Pedro Pan, as well as Robin’s mother who fostered this woman as a girl. I’m really looking forward to this discussion. Really compelling review, thank you. I stumbled upon your previous blog this summer when my online book group (Reading Without Borders; http://readingwithoutborders.blogspot.com) was reading The Immortal Life of Henrietta Lacks, and I started following along. Really enjoying your new “home” and am excited to read along moving forward. Congrats on the new blog!